My Christmas lily has 12 blooms this year, and the most delightful scent, I wish you could all enjoy it in person. It's time for my annual break from my blog over Christmas and New Year. Thank you to all my readers and online friends - both new and old, to everyone who leaves comments, book recommendations and advice. It has been so nice to be able to meet some of you in real life this year too. See you back in 2017.
my big bold beautiful Liberty Bloomsbury - has been bound, and partially quilted, so I am saying effectively a finish. a new applique project with my sister - this will involve felt, embroidery, fabric and no doubt a little muttering as I unpick things. hopefully a couple of new additions to my wardrobe. This is going to be posted before the end of December, so I can have a relaxing Christmas Break and be all refreshed and inspired for the New Year. December means Christmas baking. Chelsea's Christmas Cookies from her Scrumptious book were first up. Quite a simple recipe, the icing was yummy. meant to have silver cachous, but I only had these coloured ones which I thought were very festive. Verdict: Well needless to day these didn't last long. They are delicately spiced, deliciously chewy a day after they are made. These will probably be made again before Christmas. In fact I might put Mr J and Miss B on the job when they finish school. Verdict: All the food was eaten, so I think that means everything was a success. Week Three: A morning tea at work saw me making Raspberry and Chocolate Coconut Ice from Cuisine Magazine issue 161, while a surplus of old bananas got used up in Best Ever Banana Bread from Annabel Langbein's Celebrate Summer Annual. Verdict: Fiddly to make, I used raspberry essence which gave a nice flavour but not the colour, so had to add pink food colouring. If I had felt like splurging on my work mates, possible the dried raspberry powder may have been a better option. The banana bread was a nice easy recipe, it makes two loaves which is very handy with an almost teenage boy in the house, tastes delicious too, I added chocolate chips, cranberries and coconut from the suggested list of ingredients. Week Four: I always make a dessert to take to the in-laws for Christmas Day. This does prove to be a challenge in itself, as my mother in law is allergic to dairy and chocolate!! A pavlova is my standby dessert (she can scrape the cream off) - this year I am planning to make Coconut pavlova with mango and passionfruit from issue 120 of the New Zealand Taste Magazine. I'll try to get a photo before it's served up. I guess the big question now is do I keep this monthly post going in 2017, are you all still interested in reading about my cooking endeavours? Would anyone be interested in doing it with me, perhaps if we link up each month (if I can work out how to do that). Miss B, Mr J and I ventured into the madness that is Auckland City at Christmas time, to see the Lego Christmas Tree in Aotea Square. took more than 1200 hours to build. It is lit up at night and has some uniquely kiwi decorative features also -the pukeko, Santa with a surfboard and the kiwis. Remember that secret sewing I told you about in March. Well I can finally reveal what it was turned into. Over the weekend Mum celebrated her 70th birthday, and the double sided quilt my sister and I were making was finally gifted to her at a surprise birthday party we held at my house. Needless to say the pattern was purchased, downloaded and fabric was cut that afternoon for the first block. On the whole it was an easy if some what time consuming block to make. I had a few issues with blocks not ending up the correct size (how does that happen, when everything is cut and sewn the same), but I was able to work with that. Part way through the creative process, I decided it was looking a little to dark and heavy, so I made three blocks up using some green Kate Spain fabric as the inner star, I love how these have lifted the quilt and highlighted some beautiful fussy cut flowers. I added an extra 5 blocks to the original pattern and ended up with a top almost 70" square. 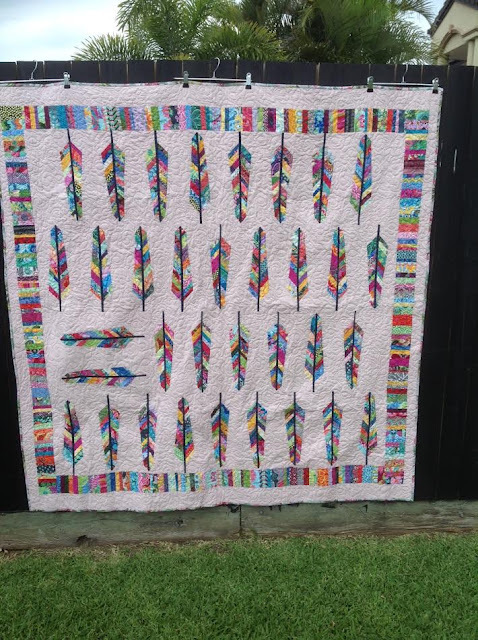 My sister had a little trouble deciding on patterns and colours for her side, (three different patterns were started) but in then end went with Anna Maria Horner's feathers. which she made at 83% and used a soft dusky pink as the background for them. She used a combination of Kaffe Fassett, Amy Butler and Anna Maria Horner fabrics for her feathers. 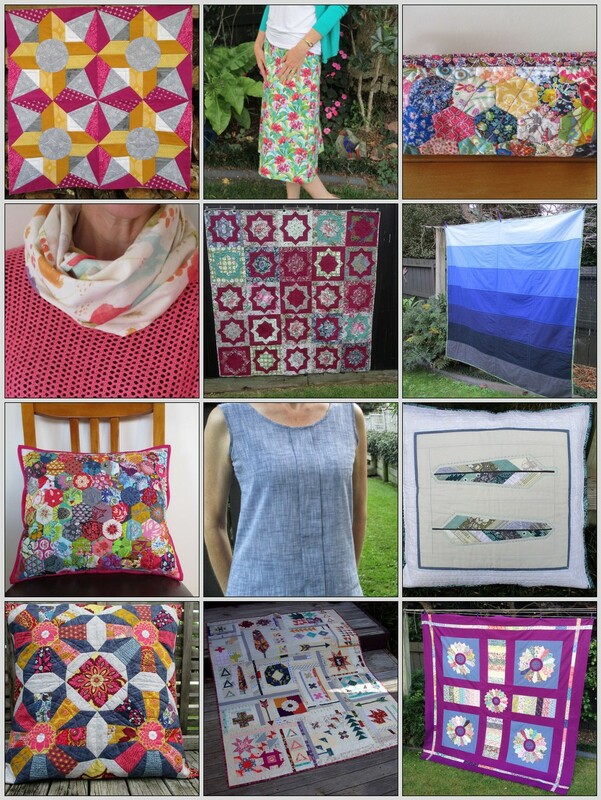 She is very much a bright and scrappy quilter, so these really reflect her. 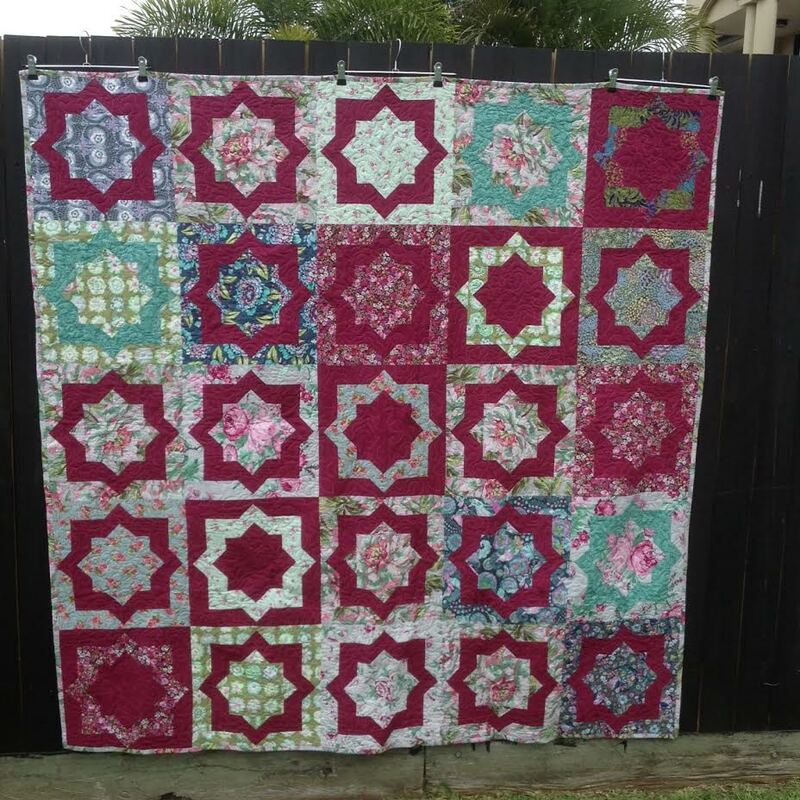 Funnily enough, Mum was the courier for taking my quilt top over to Brisbane, so my sister could get it quilted. We decided that an all over design would be best, not really highlighting either side. Quilting was done by Chris from Sewco. The binding was made from the original fabric that Mum picked. So the big day has now been and gone, the quilt was given to Mum, tears almost flowed, bubbly and birthday cake were consumed, lots of photos were taken, and now the birthday quilt is at it's new home. Loving // having all my family together today for a surprise birthday celebration. Eating // all the yummy food my sister and I prepared. Drinking //bubbly - cos we were celebrating. Feeling // a little tired, but oh so happy that it all worked out perfectly. Thinking //of Christmas now that the surprise birthday party is over, so a few handmade decorations have gone up. Dreaming // of long lazy summer days. I have just participated in a simple swap with my friend Susan who lives in Australia. She commented recently on a blog post that she loved the felt Christmas decorations I was making. I offered to make her one and she very kindly offered to send me some fabric she recently purchased in a destash. Now that she has received them, I can show what I made her. I love doing little swaps like this, it is always nice to get some happy crafty mail. Some of the lovely flowers in my garden at present. The Cosmos are thriving, my Feijoa trees have flowers, so fingers crossed they turn into fruit this autumn. My Star Jasmine (of which I have a lot) is a mass of blooms and scents the evening air so beautifully, if only it was warm enough in the evenings to sit outside and enjoy it. My lovely Calla lillies have just started to flower. At the beginning of 2015, Linda and I swapped some bulbs, ( her lemon callas for my mango callas) hoping for flowers last summer. Nothing happened, but this year they have started to bloom, the colour is actually a beautiful clear lemony shade not the lime shade it appears in the photos. The ever faithful African marigold - I plant these in my vegetable garden as part of my companion planting scheme. What's flowering in your garden at present?